Glaucoma is a disease of the optic nerve, which carries the images we see from the eye to the brain. Glaucoma occurs when there is slow damage to the optic nerve due to increased pressure in the eye. This pressure is usually caused by poor drainage of the aqueous fluid out of the eye. The most common form of glaucoma is called “primary open-angle glaucoma.” This condition is painless and the patient can slowly lose vision and not be aware of the problem until it is very advanced. Glaucoma is a leading cause of blindness in the United States, especially for older people. If untreated, glaucoma can lead to total loss of vision, which is why early detection through routine eye exams and treatment are so important. FDT (Frequency Doubling Technology). This is a sensitive screening test to see if any glaucoma damage is present. It tests the health of the specific retinal cells that can be damaged in very early glaucoma. OCT (Optical Coherence Tomography). This remarkable device uses ordinary light to create a CAT-scan-like cross-section of the optic nerve and nerve fiber layers to detect damage from glaucoma. At The Rhode Island Eye Institute, Sarah Anis, M.D. 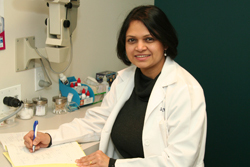 specialize in the diagnosis and treatment of glaucoma.